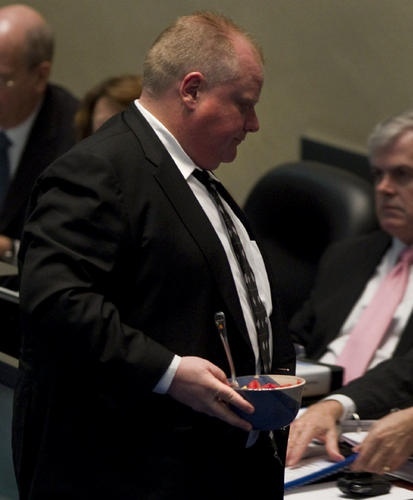 I’m worried about Mayor Rob Ford’s much publicized weight loss campaign. He’s been at it for 11 weeks now, and he’s lost nothing, it seems. Looks like political battles are easier to lose than body fat. I was talking to A yesterday, and she had a really good suggestion. The overweight mayor could take his bike (yes, Mr. Ford, we want to believe you own one) to the office and back. He could start off once a week, then move it up gradually until he’s cycling from his home in Etobicoke to Nathan Phillips Square every day. I punched his details into BBBike (see my blog from yesterday), and found a route for him. If he’s not fussy about sharing the road with the polluters (“swimming with the sharks” I think he called it), he’ll ride a bit on the Kingsway, weave his way through to Old Mill Road, Catherine Street and Old Mill Drive, feel the wind whistling in his hair as he sails through the backstreets of Bloor West Village, then pick up the dedicated bike trail next to the Queensway (yes, Mr. Mayor, a dedicated bike trail). From there it’s pretty plain sailing. Total distance is about 16km, and if he can hold 20 K per hour, it will take some 50 minutes. Think about it, Mr. Mayor, you probably don’t get there much faster during rush hour in your SUV. The office is about 60 metres lower than home, so the trip back is gonna be a bit tougher. But then you’re used to that. It was so easy to get there, but it’s only been uphill ever since. The daily ride to the office and back will burn about 600 Calories. And the really good news is it equals about 4.5 Kg in CO2 offset. I can just see it – the kilograms of unhealthy fat melting away, the kilograms of CO2 that never were. This entry was posted on Wednesday, April 4th, 2012 at 9:13 pm	and tagged with calories, CO2 offset, Rob Ford, Weight loss and posted in Uncategorized. You can follow any responses to this entry through the RSS 2.0 feed.